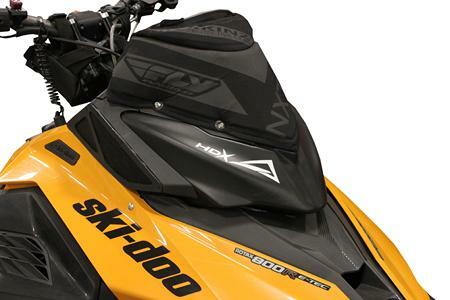 Kit eliminates the T Motion feature on Ski Doo snowmobiles. Kit includes new rear arm and lower scissor. Mounts like OEM, no modification necessary. Rear lower scissor has integrated mount locations for ARC Kit. Creates stability and control that will take your technical riding to the next level. With TM-X, your machine is concise and predictable which will build confidence while riding for navigating mountain terrain. Eliminates the erratic behavior of the machine for side hilling and trail riding. ARC kits available at lower cost due to mounts being integrated into the lower scissor. Durable powder coat finish on torque arm and polished lower scissor. Kit includes a new rear torque arm and new billet aluminum scissor. The scissor has mounts to accept an ARC kit. The T-MX is one of the most profound changes and improvements we have found to be made on the SkiDoo. The control is unbelievable and the erratic nature of the machine almost entirely goes away. These small turned Delrin parts limit the T-motion movement up to 90%. For the full on backcountry technical terrain rider who needs their Ski Doo to maintain a solid edge all the time, this is your solution. For some riders, the T-motion can wander a little too much during climbing and technical traversing and steep terrain riding. These limiters stabilize and settle the T-motion down just enough to create a predictable and dependable attitude when the machine is being pushed to the limits. Very easy to install and no modification is necessary. Turned parts install on each side of the swivel ball. This kit includes 4 sets so you will be able to install new limiters when you notice the parts are starting to wear. Depending on your riding, the limiters will last about 350-500 miles. This is a very low cost option to fine tune your machines rear suspension for the rider who needs a little more control. Anyone who has spent any time on the Ski Doo knows how the brake rotor cover gets dented up and deformed in a short time. In some cases, the cover actually can push into the spinning rotor creating a discomforting noise while riding. This laser cut, machined, and TIG welded cover addresses the durability issue while providing a high quality, stylish cover that you no longer need to worry about. The cover installs just like the OEM and no modifications are necessary. Everything you need is included and will be on the machine in minutes. Product is offered in polished aluminum, Flat Black, and White. Reduce up to 3lbs of weight. New headlight delete kit triples the amount of space in the dash glove box. SPG Rigid LED headlight kit available to add lightweight illumination for night riding. 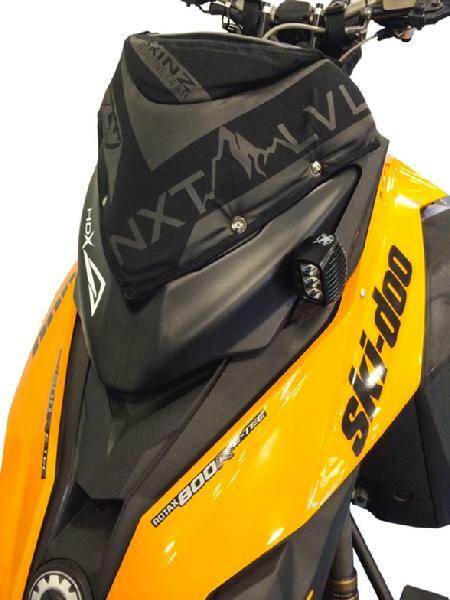 Adding to the Bret Rasmussen product line are new Ski Doo XM/XS intake air vent covers. 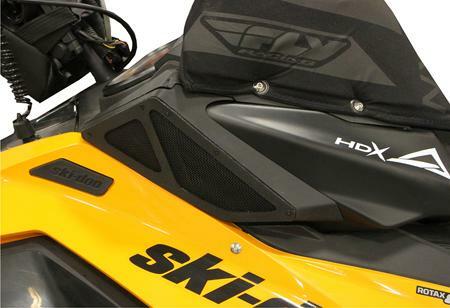 These framed, durable gorilla mesh vent covers protect the vulnerable thin intake mesh found on the sides of the hood on the Ski Doo XM/XS machines. During aggressive riding or backcountry riding, these lightweight mesh intakes become ripped or punctured allowing debris or large items to be ingested into the motor. These new gorilla mesh vent covers install easily over the existing intake areas protecting this vital area and still allowing plenty of air into the machine. All parts and hardware included for complete installation. A low cost solution to a potential high priced problem. New position places the post in a more vertical position for correct steering ergonomics. 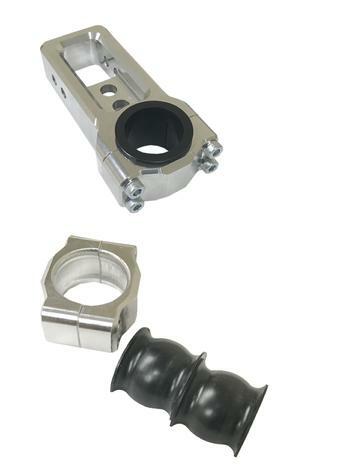 Durable, Delrin machined busings for precision fit of steering post. Stronger, reinforced steering frog on bottom of steering post. All parts included for complete installation. Remount kit moves the steering post forward 1.250” or 1.750”. Mounts allow a 2 position option to fine tune your steering post to your exact requirement. Repositions rider for optimal technical terrain riding.